Hi guys! Sorry it's been quiet around here lately. Contrary to popular belief, I was not taking this time off to memorize the dance routine to Grown Woman by Beyonce (although I totally wish I was). I've been slammed with homework (ugh, you guys must be SO sick of this excuse! :P) and have barely had a moment to spare. But I did have enough time to spare to create this look for this month's Beauty Bloggers of Central Florida link-up! This month, us BBCFL gals are sporting BLUE in support of Autism Awareness month. 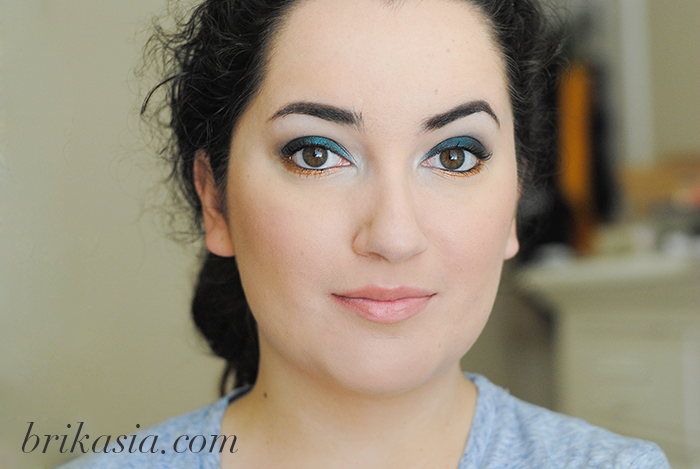 I created a blue smoky eye with a golden accent that would make a great night-out look. And it was super easy! First, taking a flat, stiff brush, I applied Magnolia Makeup Pigment in Crescent (a dark, navy blue shimmer pigment) (similar color here) all over the lid. Taking a clean, fluffy brush, I blended the pigment into the crease. As a transition color, I took MAC Soft Brown (midtone brown) eyeshadow with another fluffy brush and blended it into the crease and out towards the brow bone. To add dimension to the eyes, I used Sugarpill Loose Eyeshadow in Darling (bright teal shimmer) with a flat, stiff brush and applied it to the center of the lid. To open the eyes up a bit, I added MAC Shroom (pale cream shimmer) eyeshadow into the inner corners of the eyes, and then smudged some Urban Decay Baked (bronze/gold metallic) eyeshadow onto the lower lashline. To finish it off, I used the Vapour Organic Beauty Eyeliner in Ink in the waterline, and used the Lash Sleeve mascara. Because the eyes make such a statement, I kept everything else understated. I added a touch of the Le Metier de Beaute Blushing Bronze Duo in Traviata onto the apples of my cheeks, and used the Ellis Faas Lip Color in L205 on the lips. And that is it! Now you should check out what my Beauty Bloggers of Central Florida sistas did to show their support of Autism Awareness below! LOVE this combo and look! !